But if you look at the actual data coming out of Ohio, this thing isn't even close. As Nick pointed out yesterday, Romney has completely erased Obama's 2008 lead, just in the early voting numbers. The easiest takeaway from the polls thus far is what we've been saying for months: the sample of Democrats is seriously skewed. Some polls have Democrats turning out in the mid-40's--something that has not happened in the modern electoral era. If you think the polls are correct in assuming such high Democrat turnout, just ask yourself: Are voters more enthusiastic today to vote for Obama than they were four years ago? But even assuming the only thing wrong with the polls, in aggregate, is the turnout model, the numbers spell disaster for President Obama. Using 2008's historically high Democrat turnout, the President leads Romney by a 1.54% margin, with nearly 5% still undecided. And if you're undecided today, you're going Romney tomorrow. If President Obama hasn't shown you in four years that he deserves another term, he isn't going to convince you in the next 24 hours. What's even more troublesome for the President is that only if Democrats turnout at their 2008 levels does he lead Romney. Even a one-point shift to Republicans gives the edge to the Romney, taking the race from 48.3% Obama, 46.7% Romney to 47.6% Romney, 47.5% Obama. But if Republicans turnout at their peak, we'll be drinking champagne by 9:00 p.m. tomorrow. Romney has a +5% lead in that model. Yet, even at an average turnout for both parties, and still favoring Democrats overall, Romney maintains a 48.7% lead to Obama's 46.7%. In other words, Obama's only hope is for a repeat of 2008. And that's not by my numbers, or one or two polls. That's every poll combined. The Buckeye State is going Red tomorrow--or should we say Scarlet? But we cannot stress enough that now is not the time to take our foot off the pedal. We need to win this state and win it big--leave no room for post-election shenanigans from the left. The future of our great state, and this great nation, are in our hands tomorrow. Let's bring home a victory for the good guys. Same "the polls are skewed" arguments you guys made about Issue 2 last year. You were embarassingly wrong then. We'll find tomorrow if every pollster in America got Ohio wrong. It's not my data, and yet Obama is still in trouble. We didn't discount any stats, or omit any polls. This is a straight aggregation of all the polls in the last two weeks. 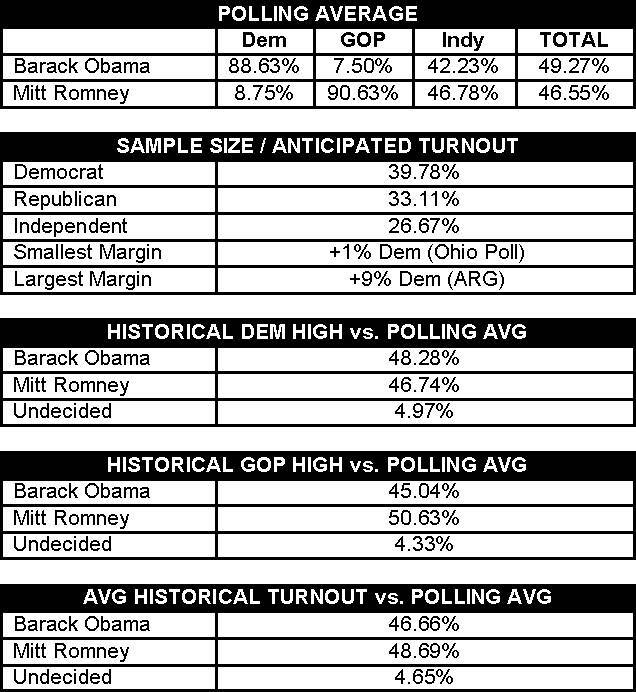 Measured against historical turnout, whether Democrat, Republican or the average, Romney is in striking distance or well ahead. Keep hoping, buddy. But voters are smart enough to see that we can't afford another four years like the last four years. So straight up - are you predicting the dems will come to the polls tomorrow across Ohio at a +6% edge over republicans? Yes or no? Is it your belief that Ohio dems are more enthused about voting for Obama than the repubs are for casting a vote for Romney? You're taking the results and "skewing" them to affect the results to meet your predetermined result and saying this is really what the polls show. It's the EXACT SAME ARGUMENTS you idiots used to try to dismiss the Issue 2 polls when one showed even LARGER Democratic advantages. And you were proven embarassingly wrong. Well, I'd say embarassing if you had any shame. But you don't. So here you are, a year later, making the EXACT SAME ARGUMENTS when the polls show your side losing with no recognition or explanation why THIS time you're right when you were wrong the last time you made these arguments. The problem is that he's taking the turnout reflected in the exit polls and a) assuming that's the actual turnout and b) assuming that was the Democratic advantage in the polls BEFORE the election. Which is funny because although these guys weren't blogging at the time, other conservative bloggers were making the same arguments in 2008 about the polls then and saying that McCain was actually doing quite well in Ohio because there is no way the Buckeye State could possibly go for a candidate like Obama. The problem is demographics. Yes, the turnout in Ohio could be better than 2008. The electorate is less white as your party's main demographic is dying out and getting crowded out by more Democratic demographics. Regardless, Fargo, not all the polls are assuming a +6 Democratic advantage. 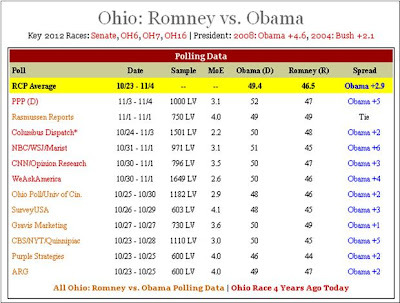 The Ohio Poll is +3 and shows Obama ahead. In case you forget, even Nick concedes a +4 D advantage is possible. Does this site really believe that Rasmussen and the Ohio Poll are oversampling Democrats? Too bad. If you can't understand why the Tea Party and SB 5 and a President who's policies make your blood boil gets Democrats fired up and ready to go, then you just are too myopic of a partisan to understand the dynamics of this race objectively. You can slap on your colonial garb and get all red faced thinking about the rant you want to make on Glenn Beck after voting against that Kenyan usurper all you want. That level of enthusasm still only gets you one vote. The right next to you is the woman who votes because she doesn't want an extremist federal government invading her right to reproductive health and privacy. The elderly couple who doesn't want to see Medicare turned into Groupon for Grandmas. By them is the auto worker. At the next polling station is the police officer who's still steamed over SB 5. Then, the Latino voter who is angry over the anti-immigration rhetoric and "self-deportation." The working mother who doesn't like to be called the 47% of moochers because she need help getting by while working herself through school. The college student who appreciates that the President stood up to the Ryan Congress and kept student loan rates from doubling. The Iraqi War veteran who appreciates that the President ended the war. If you cannot, even theoretorically, understand why voters wouldn't vote Republicans, then yes, all polls are going to look skewed to you. And you'll be writing/reading this post ever election wondering why it never pans out. Long response but you did not answer either question did you? Oh and spare me the sobbing of women lamenting Romney. Less women have jobs today after 4 years of Barack Obama. And I believe it was Obama who tapped $716 out of Medicare not Romney. Isn't that right? And over the last term didn't middle class incomes drop $4,000/yr; insurance premiums rise $3000/yr; and yearly fuel costs rise $2000 per family all under this president? Oh and if you look into the matter you'll find that student loan rates were set to double because of past legislation passed by a DEMOCRATIC congress -- forgot about that did you? Finally, doesn't Rasmussen shows it 49% - 49% (I think he uses a +3D sample) and the Ohio Poll shows in 50% - 49% (and in the past their sample has been +3D to +6D I believe). They gave no internals on the 11/5 release did they? My guess this election might be a +R turn out -- there still more registered republicans then democrats in Ohio. Maybe the shellacking you see ahead is just a mirage? That is $716 Billion that Obama cut from Medicare -- my typo above. And on the electorate composition? I'm not sure what Ohio will be but Rasmussen predicts a +6R for the entire country in today's voteing. Gallup reports that repubs now show a 36-35 (+1R) hard party ID advantage, and a 49-46 (+3R) lead with leaners included. This gives us a range of party ID swings from 2008 to 2012, of R+11 to R+15. This is Rasmussen, Gallup and Pew not me -- maybe you don't believe them? I think Romney wins on +1R and wins BIG at +3R. Actually, the unemployment rate among women is lower than men now. That's why Romney no longer makes that talking point anymore. It's not true. I don't see a shellacking. I see a narrow Obama win in Ohio. Voter registration isn't the same as voter identification. Has America ever had a +6R in a presidential election? No. 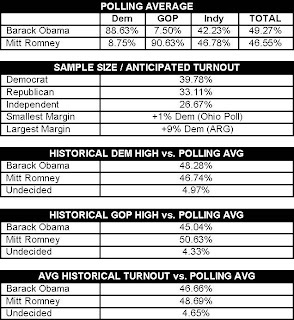 So you can't say I trust Rasmussen if you're dismissing polls that show turnout that is close to what Ohio's seen historically. Historically, the presidential turnout is trending in demographics that favor Democrats. The Romney campaign itself in its own polling is assuming an electorate that stops that trend, but not one where you go from +7 D to +6 R in four years. So not even the Romney campaign buys Rasmussen's model. What Brietbart is putting out is precisely the same arguments conservative blogs were pushing in 2008 to suggest that McCain was doing better in Ohio than the polls showed. The result? 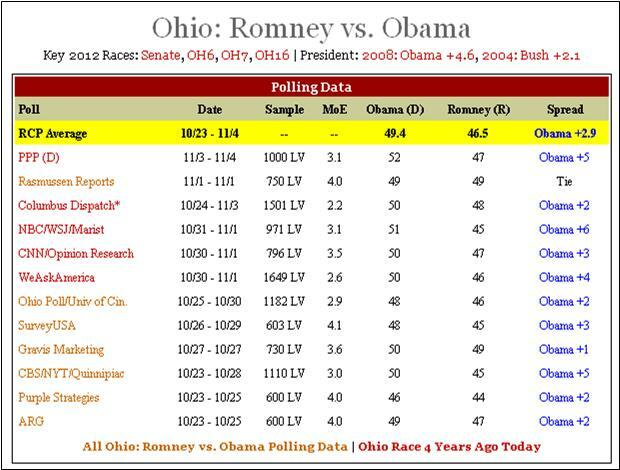 Obama actually carried Ohio at nearly twice the margin the polls predicted. So your entire hope on this election is that the same polling arguments used in 2008 lead to a different result this time. BUT look at this: For party ID change from 2001 to 2012 it is -4D and +5R (hard party ID) and -8D and +7R (including leaners). Not my numbers but Gallup's.